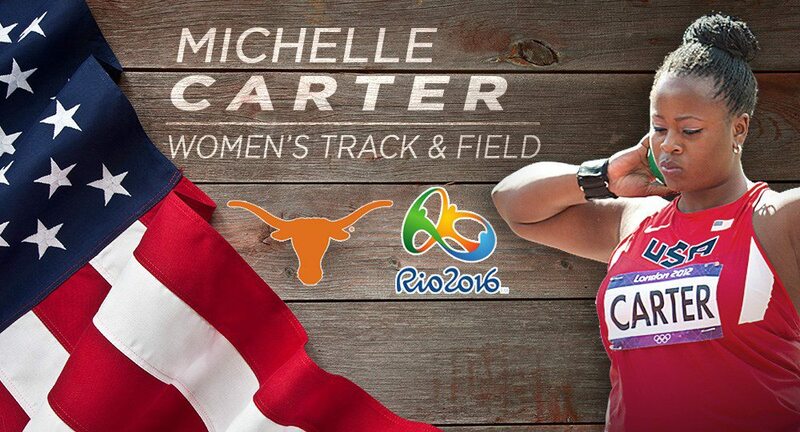 Former Texas track star Michelle Carter has qualified for a spot on the U.S. Olympic track and field team for the third time (graphic courtesy of texassports.com). EUGENE, Ore. — Former University of Texas track and field star Michelle Carter won the women’s shot put and set a new U.S. Olympic Trials record with a heave of 19.59 meters (64 feet, 3.25 inches). The victory made her the third Longhorn to qualify for a spot on the U.S. Olympic track and field team. This year was the first time that five throwers threw the shot at least 50 feet, but Carter still managed to win the event and qualify for a spot on the U.S. Olympic team for the third time. "For me the goal is always to just make the team,” Carter said. “I'm happy just making the team, but for me I really wanted to make the team and be on top. Consistency is great because it lets you know your training is coming together and my goal is to peak big in Rio because my goal is to win gold." Longhorns won the event on both sides, as Ryan Crouser won the men’s event. Texas head coach Mario Sategna said Carter’s victory was particularly impressive because of the fact that in addition to the stiff competition, Carter also had to battle less than ideal weather conditions. "That was unbelievable," Sategna said. "I think it shows where she's at within her career, because the conditions couldn't have been worse with the rain. So that was awesome to see her advance. That was special."